Ever wonder why you crave salads and fruits in summer? It’s your body telling you what you should be eating. I recently went to a cooking demonstration at Whole Foods on River Street in Cambridge at the suggestion of their Marketing and Community Relations team member David Remillard. This was no ordinary cooking demo; this one was being conducted by former Top Chef contestant Andrea Beaman, now an influential holistic health leader. 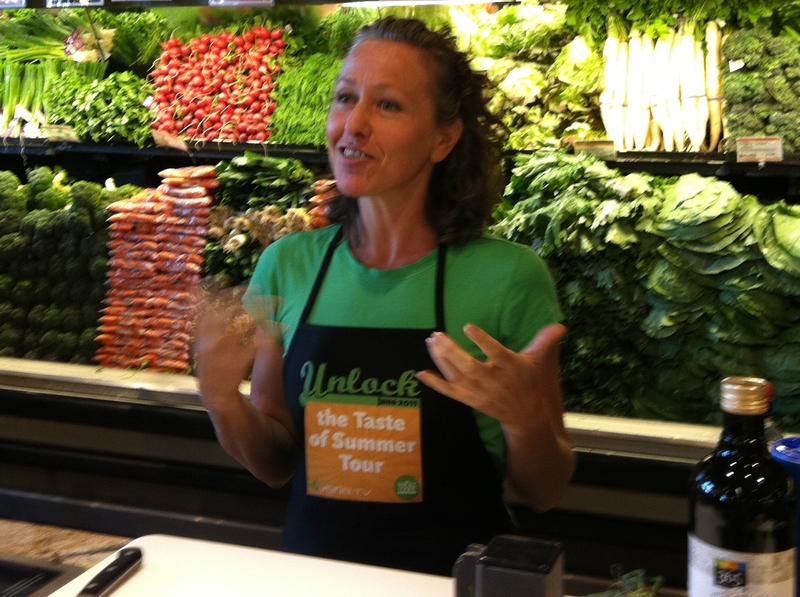 Andrea was on the Veria Wellness Unlock Summer tour of select Whole Foods stores in the southern part of the Northeast. The River Street stop was the last one on the tour, and they saved the best for last. Andrea was warm and friendly and approachable right from the beginning, even before the beginning. David introduced me and my friend Vicky to Andrea before her demo and she was just as bubbly and welcoming as I remember on television while signing the tour aprons. Andrea started out her demo by talking about cooling foods. She was keeping this demo seasonally appropriate since we are coming into prime fruit and vegetable season. It was all about buying local and/or organic. Being in Whole Foods of course she was suggesting what you could find and at farmers markets. Buy what is in season in your area! Our bodies naturally crave what is in season in our neck of the woods-fruits and vegetables full of water. Water is what we need in the summer to keep us hydrated and our skin healthy. To get back to cooling foods, these are primarily fruits and vegetables and are what are in season now- corn, summer squashes, lettuce, green beans, peppers etc. Since we live in the northeast our summer fruits local to the area are limited-watermelons, strawberries, raspberries, blueberries. But we can also find organic plums, peaches, nectarines etc that are not coming from the other side of the world. Cooling produce grows faster and are higher in water content than heaty produce-butternut squash, kale, pumpkins, apples, and potatoes to name a few. These cooling items help keep you hydrated, satiated and help our bodies to cool down. Light, flaky white fish, shrimp and scallops are also cooling foods and a good alternative to heavy meats. Heaty food is not just winter vegetables but also meat. Think about how you feel after eating a hamburger or grilled chicken or ribs at a BBQ in the middle of summer. You feel bloated, heavy, weighted down and this is because these foods heat you up. In summer you need less of these because your body is trying to cool down versus in the winter when we love to make heart stews, chicken and beef dishes to warm us up. Oily fish such as salmon, mackerel, blue fish etc. are heaty foods and should be avoided in summer. Andrea focused on corn and watermelon on the night I saw her at Whole Foods. Since corn is coming into season soon she did a corn and red pepper sauté. I do a version of this dish all the time in summer. I love fresh corn but hate how it gets stuck in my teeth when I eat it off the cob. Andrea’s dish that she made for us was butter, corn, red peppers, jalapenos, cilantro and a pinch of sea salt. Yes you read correctly, she used butter. Her motto is the best of everything in moderation and none of those fat free products that have had the fat taken away by science. She promotes whole milk, full fat yogurt and cheese and real butter. She advised us to stay away from butter substitutes (margarine, soy butter etc.) and fat free anything. Like produce, you should be eating things in their most natural form possible. Eating in natural forms also includes salt. Andrea recommends using sea salt. Yes we all have been programmed to use kosher or table salt when cooking. But the problem with those are that most have iodine added to them, whereas sea salt is in its most natural form, salt, no additives, nothing. Nothing added to collect in your body and make you sick. When you do eat meat and she does recommend it, try to buy all natural, organic and grass fed meat. All those things they manmade things they inject and feed the animals is bound to affect your body. Besides her corn sauté dish, Andrea made a second very simple but juicy, sweet and tangy watermelon salad. It was simply watermelon, lime juice and fresh mint. That’s it! I have made this dish at least 4 times since I have seen her make it at Whole Foods and everyone loves it. I serve it as a light side dish for grilled meat, yes I know meat is a heaty food, but the meat takes on the role of a side dish with us, and the watermelon is the main component. I know most people think watermelon is for breakfast or dessert, but try serving this watermelon at your next meal. Do one portion of meat and lots of watermelon salad, no starches such as rice or potatoes and see how great you feel after eating. You will probably be ready to go play tennis or run instead of wanting to curl up and take a nap. And if you think that Andreas eating habits are misguided, I will leave you with this bit of information. Andrea successfully healed her own supposedly incurable thyroid disease with the help of health-promoting foods, exercise and other natural therapies. So she knows what she is talking about. Prepare this salad right before serving as the lime juice will begin to break the watermelon down after a while. Slice watermelon off the rind and cut into 1 inch chunks and add to a large bowl. Chop mint and juice the limes and add to the bowl. Mix gently using your clean hands. This entry was posted in Recipes and tagged cilantro, mint, recipe, salad, side dish, top chef, watermelon by reneeh. Bookmark the permalink. Thanks for the introduction to Brian! 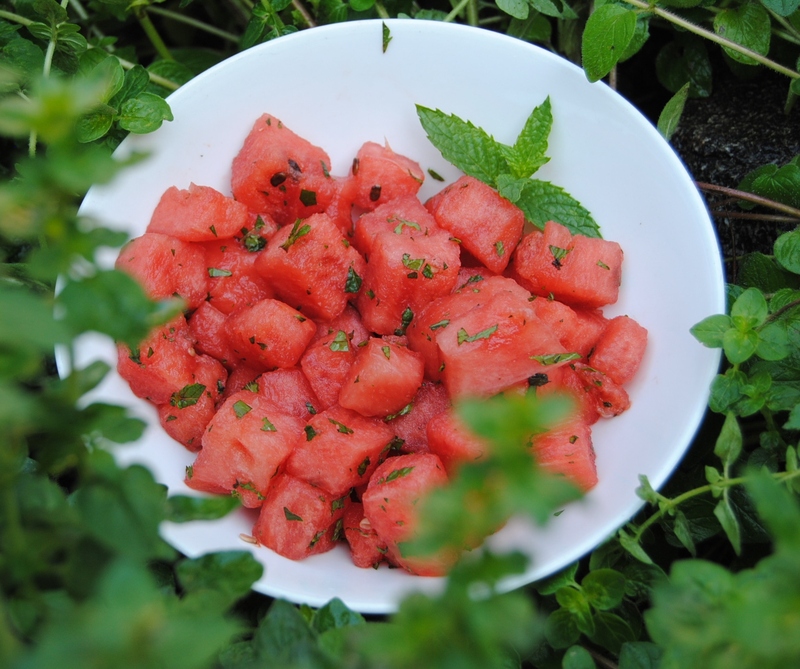 Love his blog, and love this watermelon salad! Can’t wait to serve this at Annie’s birthday party. I had you this month for SRC and I made this delicious salad… So fresh and delicious. It hasn’t gotten old either. Thanks!